What Secrets Are You Giving Away With Your IT Equipment? What Secrets Are You Giving Away With Your Old IT Equipment? Home » Security » What Secrets Are You Giving Away With Your Old IT Equipment? Organisations put considerable resources into buying and installing new equipment, however the often neglected side of the story is what happens old equipment. For some businesses it’s just a matter quickly deleting any sensitive files before throwing it into the skip or simply dragging it out onto the nature strip never to be seen again. Identity and intellectual property theft is a very real risk in today’s modern age with malicious hackers frequently combing through disposed equipment to find valuable information. Even if equipment is formatted, files and configuration may still be recovered posing a serious security risk. Where does this waste E-Waste end up? Initially old equipment is sent to central processing stations out in the open such as at local tips. Quite frequently individuals will sift through this gear looking for anything that appears valuable. After this the remaining equipment is often sent to developing countries where it is broken down by hand into working components which can be re-purposed and sorted raw materials. If the equipment hasn’t been properly sanitised it could end up living a second life with your data fall into the wrong hands! What equipment is at risk? If it stores data, ever was connected to the organisations network or holds a configuration you should be mindful of how its disposed. Storage devices such as USB Keys,memory cards hard disks and solid state disks should be securely formatted and overwritten with zeros if they are planned to be returned to service internally within the company. If a storage device is to be disposed of, we suggest physically destroying the device as opposed to lengthy format times with wiping tools such as DBAN. This removes all doubt that the data could ever be recovered or an error occurring where the data wasn’t actually fully wiped before it was disposed. Large photocopiers and large network printers may contain inbuilt hard disks which can save a copies of all scanned and printed documents. Before disposing printers you should first check to see if it has inbuilt storage and if so it should be securely formatted. 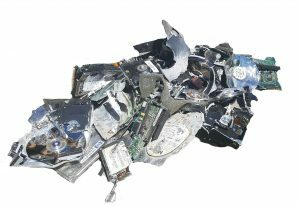 For sensitive environments the hard disk should be removed and destroyed. Remove all identifying stickers, tags from the equipment to make the device harder to track back to the organisation or who used it. Devices configuration should be wiped from the device by performing a factory reset and re-flashing the device. Information like saved WiFi credentials, file paths and hard coded network settings can be extremely valuable for a hacker. Manufacturing computer components requires a substantial amount resources which has an environmental impact. We encourage the reuse of equipment where possible and recycling once it has reached the end of its life. 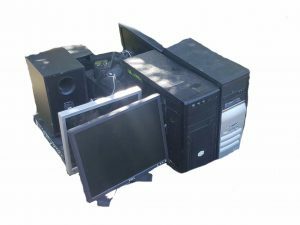 Many E-Waste organisations will pick up your old equipment for free and dispose of it responsibility. We recommend always formatting your equipment first and researching how they will ensure your privacy is maintained. Does your business need helping managing your network or have any questions?